When Courtney Liu enrolled at Duke, she was still debating whether to go to college or to continue pursuing a dance career. During her freshman year, she frequently told her parents she wanted to leave and go back to dancing as she struggled to find a dance home at Duke. That’s when she found DukeEngage. “I chose the Zhuhai-China program because Zhuhai is my grandfather’s hometown and it was the only program that focused on the performing arts,” she said. Little did she know the experience would change her life. During her eight weeks in Zhuhai, Liu taught arts education and English to students at the No. 9 Middle School. When a student was taken out of Liu’s dance class because she was “too good at school to be wasting time with the arts,” it ignited a spark in Liu. She realized that what this student would be missing was also missing from her own life: dancing not for accolades or an audition, but for the sheer joy of self-expression. “As my love of dancing rekindled, I found myself dancing everywhere in Zhuhai…on my lunch break in an empty classroom, on the roof of the school in the rain, and in the dance studio with my students and the other dance teachers long after official classes had ended,” she said. “My time in Zhuhai fueled my dancing spirit and encouraged me to perform, choreograph, and teach more during college. Liu returned to Duke with a renewed commitment to pursue her passion. Her bolstered confidence from DukeEngage led to more involvement in Sabrosura, Duke’s premier Latin dance troupe, and with the local community. During her sophomore through senior years, she performed more than 40 times with Duke ensembles and taught at Nina’s School of Dance, Triangle Ballet School, and Walltown Children’s Theater. She also completed a psychology thesis that evaluated a dance program for children affected by domestic violence. Those experiences, fueled by DukeEngage, helped pave the way to a thriving career in dance. 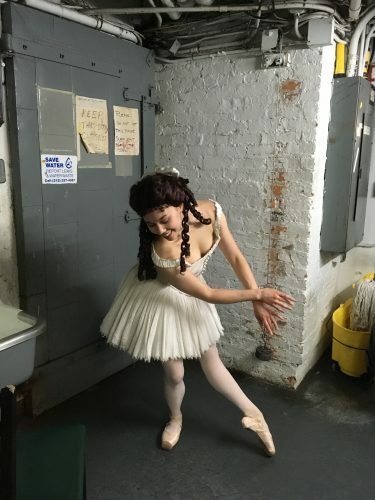 Liu is currently performing in the Ballet Chorus and has also served as an Assistant Dance Captain and Meg Understudy in The Phantom of the Opera on Broadway. In addition, she has volunteered as a dance teacher for CityYear, Artists Striving Against Poverty, and DMF Youth, a program that brings dance cardio to underserved children.